At the shout of “Go”, at precisely 10:00 am, we tore off up the stone track ahead of us. 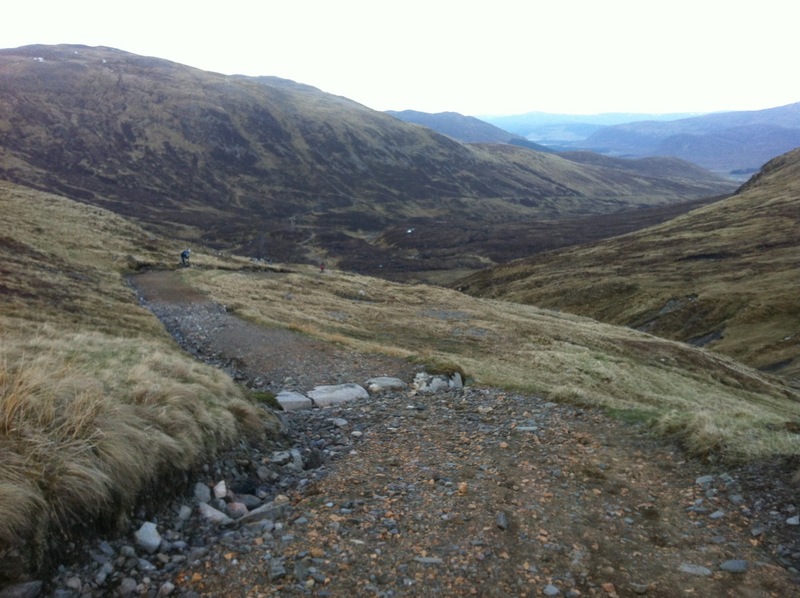 The first part of the route followed the West Highland Way to Kinlochleven, the major difficulty in this section being the Devil’s Staircase. The initial miles were much more straight forward, and for the most part completed at a brisk pace that just allowed for conversation while we still rode as a group. The pace up the first long climb to the Glencoe Ski Station was beginning to put me outside my comfort zone, so I backed off a bit and watched the leading group of 5 riders edge away (Aidan Harding, Phil Simcock, Mark Goldie, Phil Richmond, James Gillies). The descent that followed to King’s House was fun, but it only served as short respite before we got onto the Devil’s Staircase. The first long push of the day followed, which I enjoyed in the company of Rob Wixey and Alan Goldsmith. 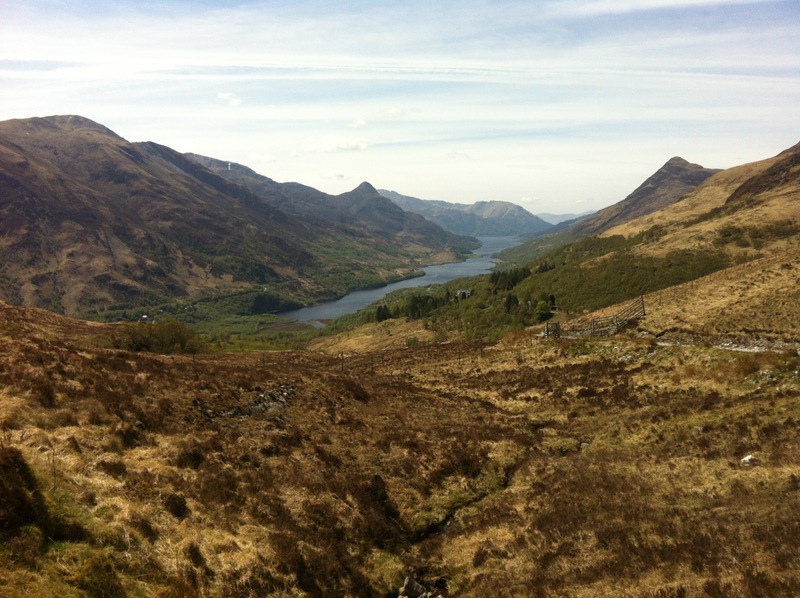 The moderately technical descent brought Rob and I into Kinlochleven, at which point we left the West Highland Way and heading North-east towards Loch Elide Mor. The temperature was beginning to hot up, and the tarmac climb that lead out of Kinlochleven began to feel unrelenting and my legs lacked the strength and commitment I knew I was going to need for this race. Trouble was, I was only 45 km into the route and this wasn’t what I needed. I watched Rob pull away easily up the climb and I struggled on to find my rhythm. At the top of the pass, there was a great view to admire while I took on some food. I also got my iPod out to listen to some music in an attempt to take my mind off the riding. Soon I was skipping along the side of Loch Elide Mor with Jimi Hendrix’s Purple Haze in my ears. At the end of the loch, the track crossed over to the next catchment, and in the distance I saw the first of several bothies on route; Meannanach, though far too early in the route to be of any use. The path crossed the river. I searched momentarily for a point where I could pick my way across and maintain dry feet, before realising the futility of it. Once across, I saw Alan Goldsmith and Mike Toyn arrive on the opposite side. The trail that followed was only 5 km, but seemed to take a considerable length of time. It looked straightforward, but was punctuated by boggy bits and small gullies that required a seemingly endless repetition of ride, dismount, gully, remount, ride, dismount, bog, push, gully, push, bog, remount, ride, dismount. Alan, the driving force behind the event, asked me if I hated him yet. I said not yet, but it was early days. Alan and Mike seemed much quicker across this terrain than me, and soon they were off into the distance. At the bottom of the Meannanach valley I stopped for another bite to eat, still not really feeling on form. As I was finishing up, three more competitors approached; Greg May, James Gillies (I passed James on the Devil’s Staircase descent) and Daniel Jessee. We were all in agreement on the quality of the preceding piece of trail, so at least it wasn’t just me. We rode off together, but it wasn’t long before I’d at last found the beginnings of some form in my legs and began to pull away. By Loch Ossian, I was on my own again in the late afternoon sunshine. The riding was starting to flow and the scenery was pretty special. It was Strath Ossian that really made me aware of the different scale. I could ride for an hour and still be in the same Glen. This is pretty much how the next few hours would play out. Long passages through this glen and that glen, frequently with stunning scenery. 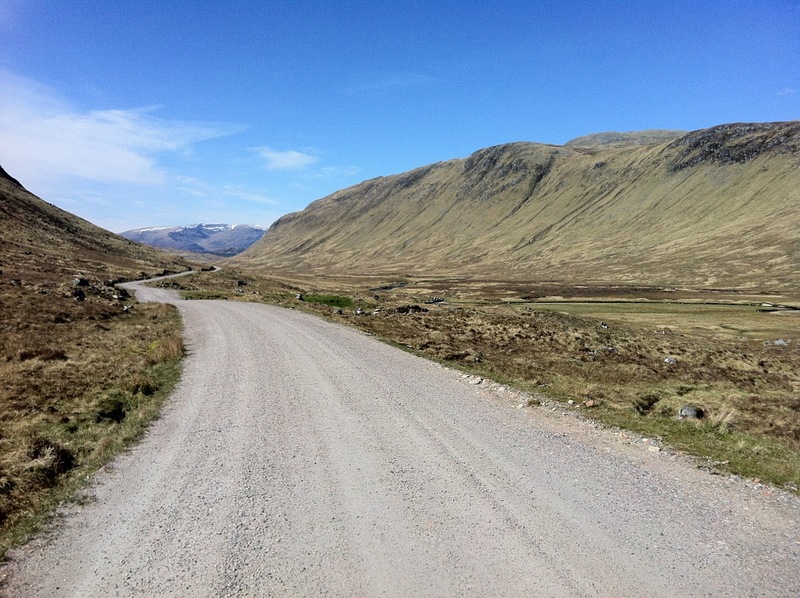 Eventually the route joined a road and turned from north east to north west to head towards and eventually over the Corrieyairach Pass. Greg caught me at this point and we rode along caually chatting about the route, our relative placement in the race and fact that there now seemed to be a bit of a headwind and the temperature was starting to drop. We stopped at a river to fill our bottles, and sitting back on the grass for a moment found James and Daniel had caught us up. It served to illustrate that even if you appear to be alone in the race, you might easily be less than 10 minutes to the next man. 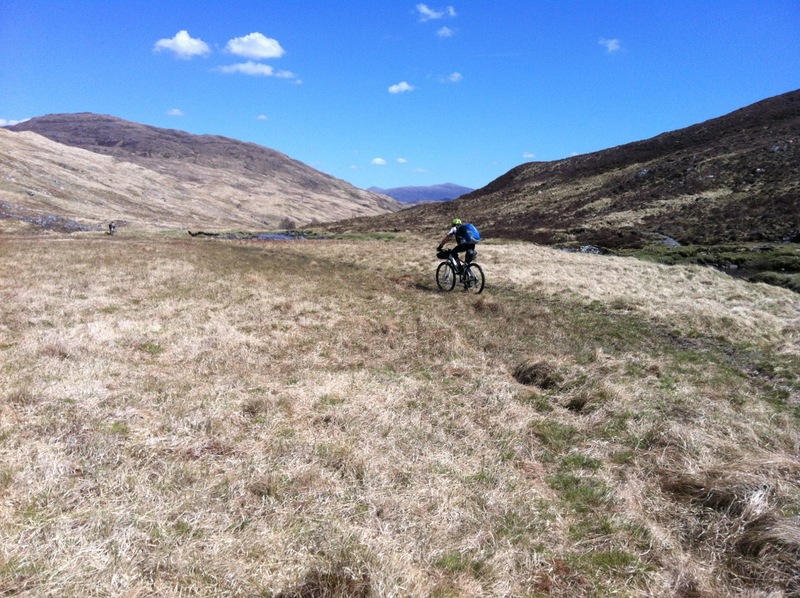 We began the ride up the Corrieyairach Pass together, though got strung out as we went on. James was the first to go, the demands of his 34:19 gearing forcing a slightly quicker pace than my 32:19. Greg and Daniel followed, and after a long push toward the top we regrouped for the descent. The descent was fast, though punctuated with water bars that required concentration and effort to clear. Part way down the descent was my Plan B overnight spot; another bothy called Blackburn. I slowed on the descent with the intention of stopping here, but Greg and the others persuaded me that food in Fort Augustus would be A Good Thing. They were right. We rolled into Fort Augustus just before 10:00 pm, with nearly 100 miles completed. We found a takeaway that did pizza, and through chance at being at the front of the queue, I managed to order the last 12″ they had. The others had to make do with 10″ ones. While we were there, two other riders joined us: Steve Wilkinson and Alan Sheldon. We ate outside together discussing the general difficulty of the route so far. The conclusion was it was much harder than we had all anticipated, and I for one considered it to be one of the hardest 100 miles I’ve ever ridden. Suitably fed and watered, the six of us rolled out of town together. Into the woods on the edge of town, the group split. Greg, James and Steve seemed happy to call it a day there. Alan looked set to carry on, as did Daniel. I was feeling remarkably refreshed after food and a can of Coke, so opted to go on further too. Despite being nearly 11:00 pm, I felt I might yet be able to make my Plan A bothy. I left Daniel behind and rode up into the forest to catch and pass Alan. After the forest, a section of road through Invermoriston brought me to another forest that I knew from my planning sesssions would be a push. It lived up to expectation and a long trudge began. The light from Alan’s bike was never far behind, and it wasn’t until the road topped out of the forest and went further to the reservoir that Alan decided his day was done. I wasn’t quite there yet. A few more kilometers past Loch ma Stac would see me on the descent to a bothy for the night. Loch ma Stac looked a bit odd on the route map. A track went to it from the south, and continued from it from the north, but the eastern shore had no track marked on it as such, which implied we would be riding the shore of the loch. True enough, the track stopped and a surface of large rocks and boulders faced me as my “path”. Initially the bike rolled over it quite well, but it was difficult to pick the best line in the dark. I rode when I could, and pushed the bits I couldn’t. It was only a mile, but in the dark felt like a lot further. Eventually, the track at the far end was reached, and I had a short and straightforward descent down the bothy. I arrived at 02:07 am, and perhaps unsurprisingly was the only one there. I’d ridden for just over 16 hours, and though I was on schedule in terms of location, there was no denying it was one of the toughest days I’d had in the saddle. I had a quick bit of food to eat, drank a recovery drink and quickly sorted my kit out for a few hours sleep. Tomorrow was going to be interesting. Are you using that home made battery pack for extra power? How do you have enough battery power for your lights every night? I’ll do a post on kit too later. 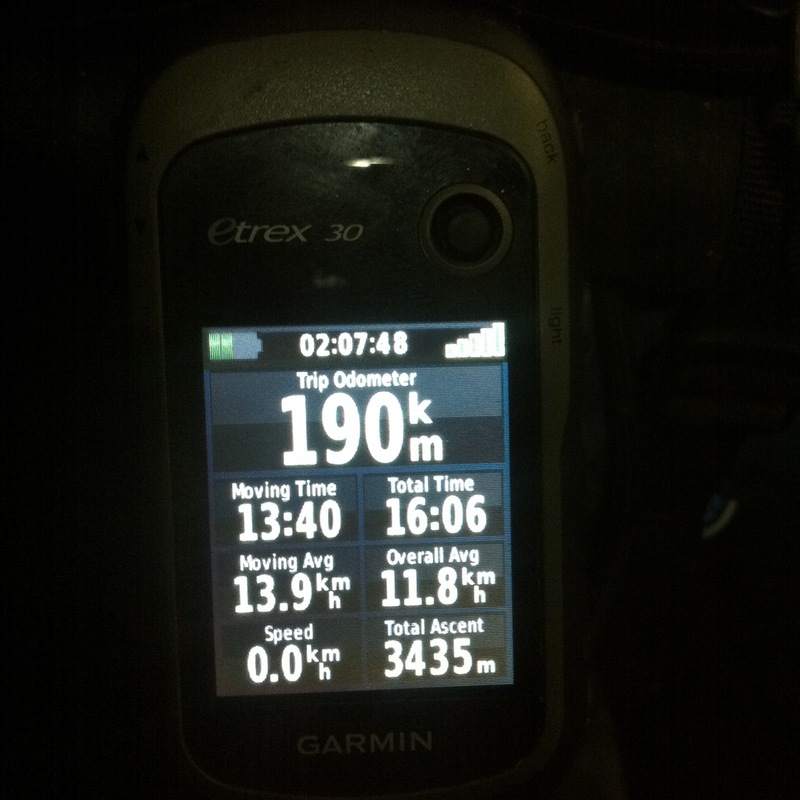 But to answer your question, I used a Garmin Etrex 30 which uses replaceable lithium batteries. For lights I had an Exposure Diablo set to programme 8, which gives 10hrs on high and 24hrs on medium.